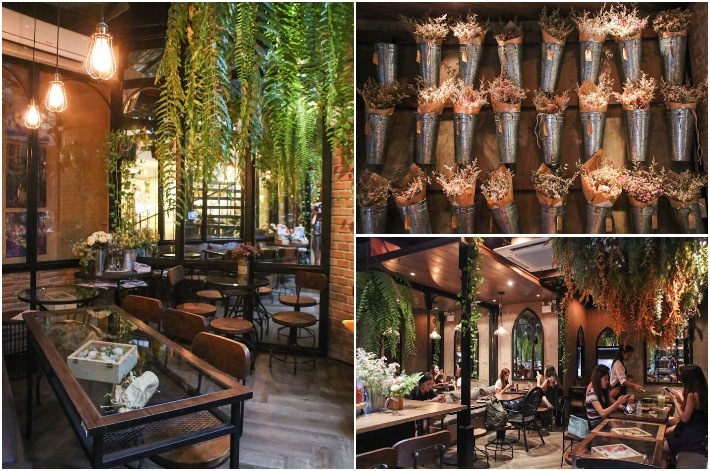 The Blooming Gallery Tea Cafe & Bar is a rustic cafe hidden in The Ei8ht Thonglor shopping mall. 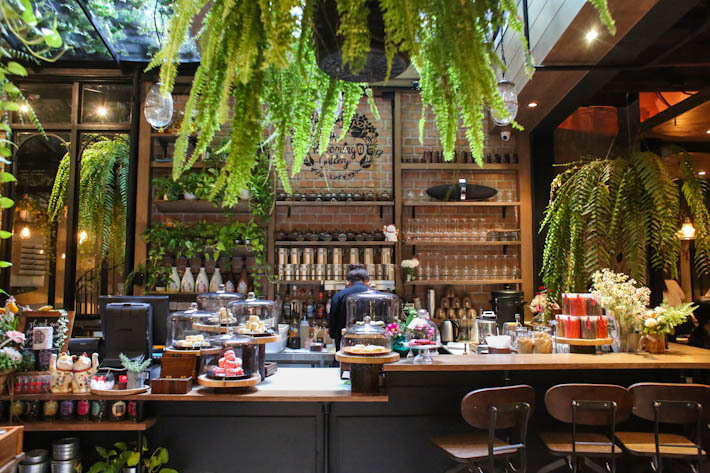 Walking into the cafe is like wandering into a mini secret garden where you will be surrounded by colourful flowers and lush greenery. Imagine having beautifully plated desserts while sipping on premium tea or aromatic coffee in a glasshouse where sunlight is able to filter in during the day—this is the perfect gathering spot for high tea with your girlfriends. If you are looking for a place to rest your tired feet after doing some shopping in central Bangkok, drop by The Blooming Gallery Tea Cafe & Bar in Thonglor district. The founders of the cafe were inspired by a famous French artist, Oscar Claude Monet and you can see that being reflected on the menu itself. Do not be surprised to see that many of the dishes in The Blooming Gallery are named after this artist’s impressionist paintings. 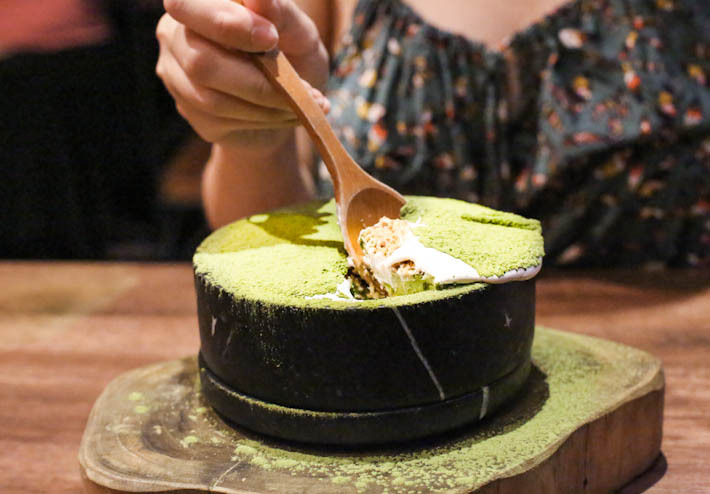 A Path In The Forest (THB380/S$15.63) is their signature dessert and this four-layer dessert is made up of cheesecake, matcha mousse, crumbles and fresh cream. 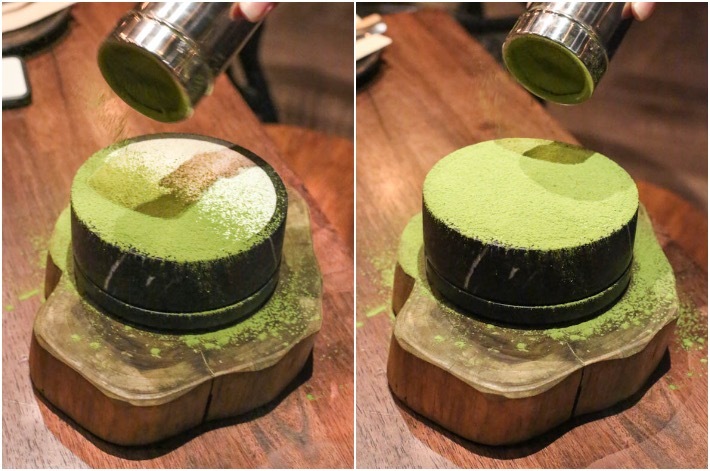 Get your cameras ready when they serve this dessert to you because the staff will sprinkle Matcha powder imported from Kyoto on the top most layer. It is highly recommended to dig into the base of the dessert and have all the layers in one mouthful to taste all the different flavours and textures. While we enjoyed the light and fluffy cheesecake with earthy Matcha powder, there was nothing outstanding worth raving about. Another gorgeous dessert that caught our attention was The Blooming Garden (THB350/S$14.40). 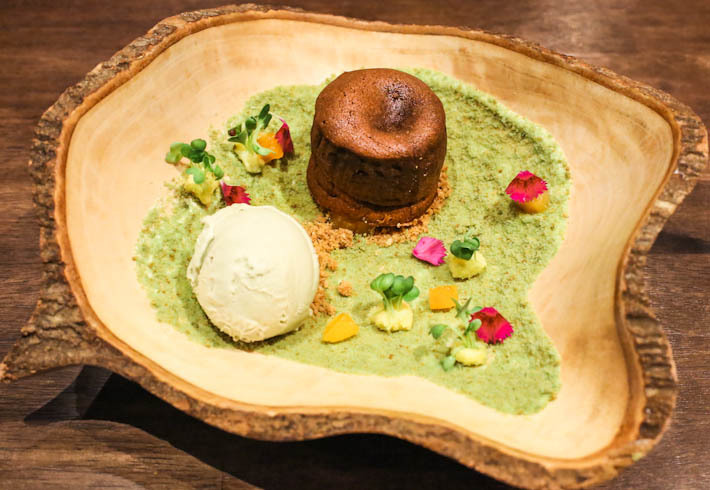 The warm chocolate pistachio lava cake was served with pistachio gelato atop a layer of pistachio powder. The rich molten chocolate was slightly overwhelming for us as it masked most of the pistachio flavours but fans of chocolate will definitely enjoy this sinful dessert!